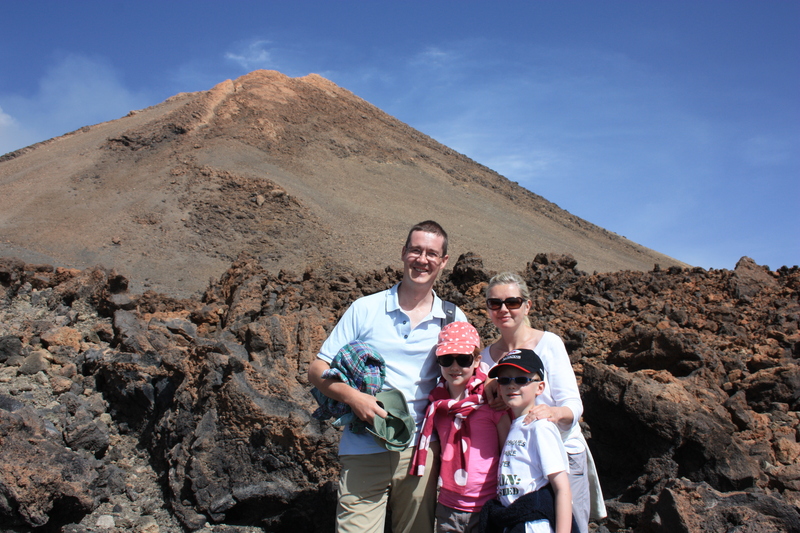 Mount Teide stands at 12,198 feet and is a dormant volcano. 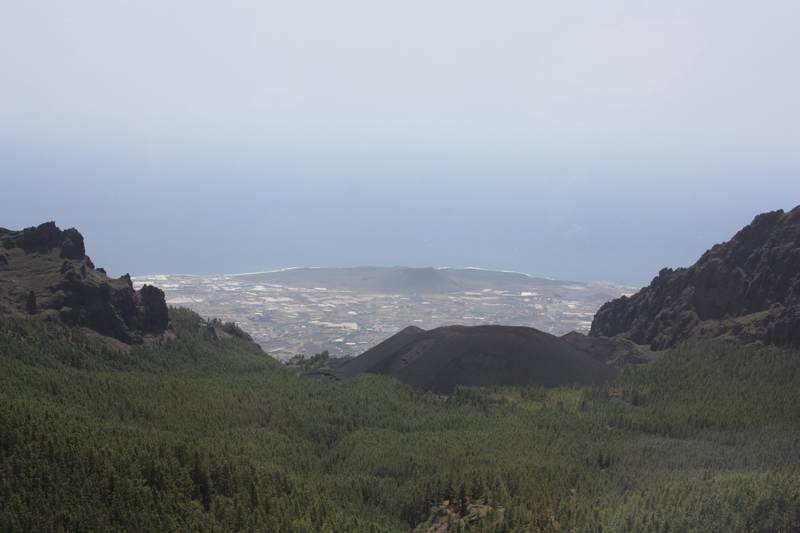 It is the highest point of Tenerife, and indeed Spain itself. Our coach was lucky to make it up. The day before a forest fire had broken out in the hills to the south. The road our coach intended to take had been closed due to the fire. We tried another route, passing through various road blocks. At one, we got through but the coach behind us was turned back and the road was then closed. True to their travel sickness form, both of our kids were sick on the way up. Why supermarkets punch holes in the bottom of their carrier bags I simply do not know. It can be very inconvenient when those bags are called for in an hour of need. The road up Teide only goes as far as 7,650 feet. After that you have to take a cable car. It is expensive (but worth it), costing the four of us 75 Euros. At various stages of the ride there were metal pylons, supporting the cables. As our cable car passed these points it swung to and fro. I quite enjoyed this. So did some others, but I am not sure everyone did. The cable car ascends to an elevation of 11,600 feet. This is not quite the top; to get to the summit you need to apply for a special pass. These are free, but numbers are limited. 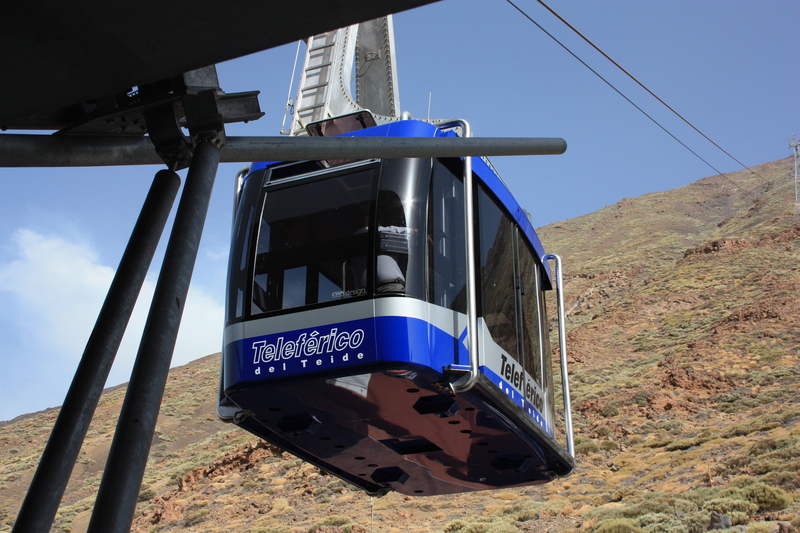 They can be obtained online at Teleferico del Teide. I tried a couple of weeks prior but they had already been allocated. Although we were told to take warm clothes, we didn’t need them. We could have sunbathed up there if we wanted to. At the top cable car station there are two paths which weave their way through the lava landscape. The air was still and silent – the sort of silence that only altitude can bring. It was beautiful. We strode out along the path and found ourselves slightly out of breath. My daughter got a headache. I had a slight one too. We were experiencing the effects of the slightly thinner air. The time passed all too quickly. We took the cable car back down to the coach. Due to the road closures, we had to leave by the north. On the way back down we stopped briefly at “La Tarta” (“the cake”). 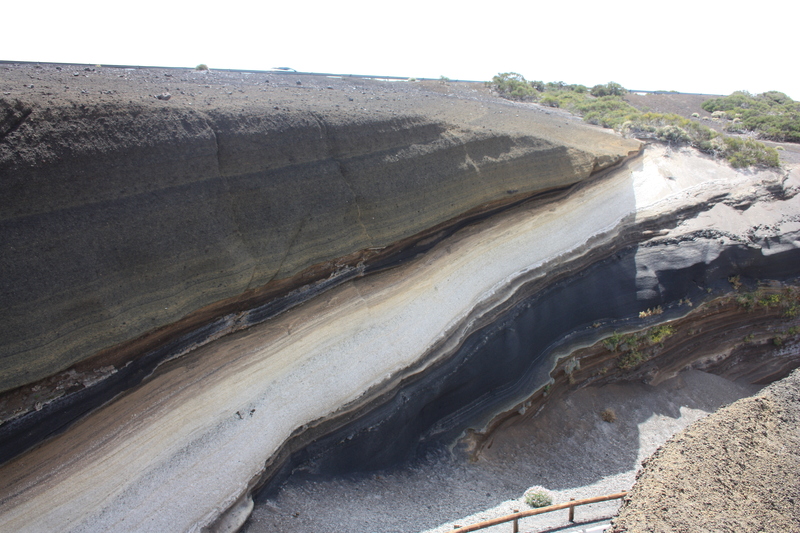 This is a layered rock formation; each layer has been deposited by a different eruption. Centuries, perhaps millenia, elapsed between each eruption and layer of the cake. The white layer is pumice, light and porous. Fragments had been hurled into the air by a past eruption and carried here on the wind. The black layers are basalt, and indicate eruptions with a low gas content. The red layers are also basalt, but here water had caused them to oxidize, hence the reddish colour. The coach wound its way back down through the hills. 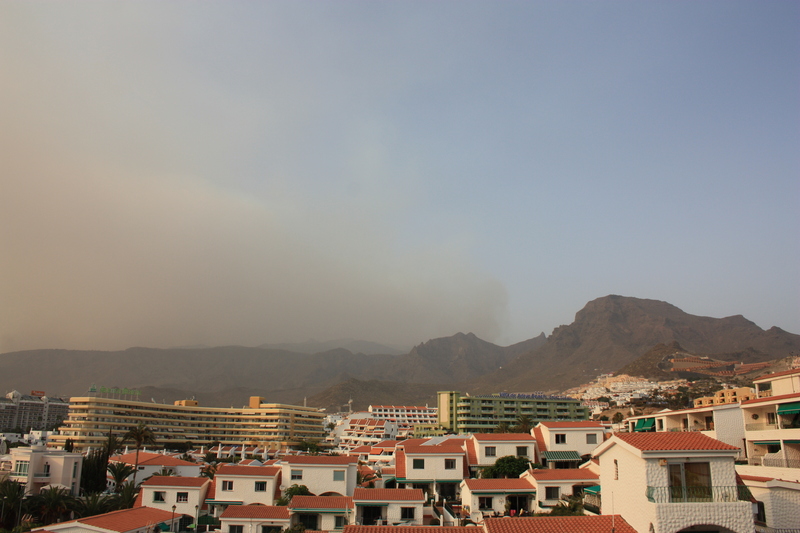 As the road twisted and turned, our own 9-year old volcanos erupted again, poor things. Scientists will marvel over the caked vomit of “La Tarta Coach” for years to come, I am sure of it. I had my GPS on for most of the way up and down: CLICK HERE FOR LINK TO INTERACTIVE MAP!!! 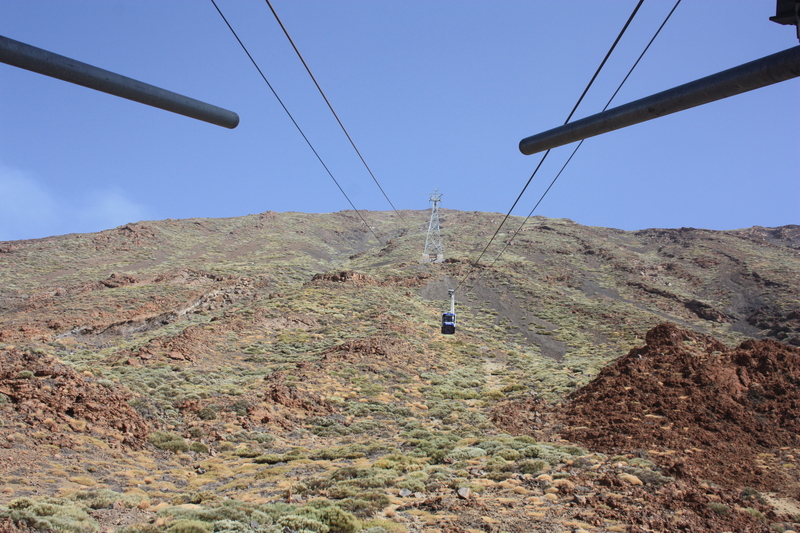 This entry was posted in Canary Islands and tagged cable car, Mount Teide, Teide, Tenerife, volcano, vomit. Bookmark the permalink. I empathize with the altitude sickness you guys had – I’ve experienced it myself and know that it isn’t fun, but still definitely worth the discomfort… Volcanoes are *very* cool! Jill, you’ll be pleased to know that Harry coped quite well up there!! Have you seen the pictures I posted for you?